The sounds of the drum echoed throughout the airport hangar at Volk Field on Saturday, Nov. 10. The sounds were an annual tradition, dating back more than four decades. It was the 41st Annual Veterans Powwow to honor all veterans for their service and sacrifices. Ralph Decorah offered the prayer at the beginning of the event. “We, the members of Volk Field, are happy to have you here today and including us in this 41st Annual Veterans Powwow,” said Volk Field support staff Senior Master Sergeant Vaughan Wilberg, who provided the keynote address. “Today, as well as Nov. 11, is to honor veterans who have served and to remember the sacrifices they have made. As you might already know, Veterans Day first started as Armistice Day 100 years ago. It was established to celebrate the end of World War I. After legislation was put forth to bring about what we now know as Veterans Day,” Wilberg said. “It was 101 years ago when the Army’s 32nd Division came into existence and stormed its way across the front lines of France and Germany. During that First World War, they earned the now-famous Red Arrow moniker by piercing every enemy line they encountered. The soldiers of the 32nd Division joined more than 122,000 other Wisconsinites who answered the nation’s call in World War I,” Wilberg said. “The 32nd served with great distinction and suffered more than 14,000 casualties over its course in Europe. But, as we now know, The ‘War to End All Wars’ was only the beginning of the bloody 20th Century for America’s armed forces,” Wilberg said. “Truly, only a select few have earned the right to call themselves veterans or warriors. And those who have deserve the utmost respect and a distinguished place in our society. These veterans have served and endured combat in places like Coral Sea, Guadalcanal, Sicily, and the beaches of Normandy,” Wilberg said. “They fought in the steamy jungles of Vietnam and on the frozen Korean peninsula and in the burning hot sands of the Middle East. They have endured the Baton Death March and evaded capture when shot down behind enemy lines. So, on this Veterans Day, I ask that you take a moment, say thank you to a veteran. Thank them for the blessings they have secured for not only our generation of Americans but for countless more and millions of others around the world,” Wilberg said. 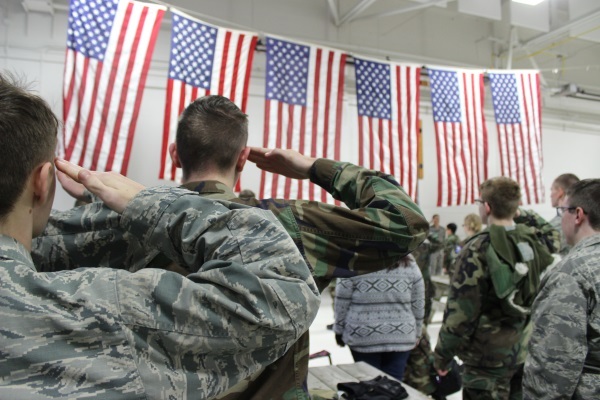 During the ceremony, a group of 66 cadets from the Wisconsin Civil Air Patrol joined in the festivities. They talked with the veterans present and offered their respect for all those who had served. The cadets are minors, ages 12-21, from all over the state. At the beginning of the songs for the different branches of the military, they joined dancing on the main floor. George was one of 28 Ho-Chunk warriors to serve in World War I. “Grandpa joined the service because he was a warrior and he saw the need to defend. He saw the injustices going on and he needed to stand up against them. He couldn’t sit on the sidelines even though he wasn’t even considered a citizen,” Day said. The annual event is not just for adults, but also especially for the younger generation, Day said. It is out of respect for friends and relatives. Flags were raised at the beginning of the ceremony, flags that had draped the coffins of veterans and were brought to the event by relatives. They were honored by silence and a long-standing salute. Day and Quentin Thundercloud have been responsible for organizing the event for many years. Thundercloud served in the Army from 1965-68. Thundercloud has officially removed himself from the duties after this year’s event. He has been training Kevin Day to take over his role next year. “When it started, it was run by the Miner women, who were referred to as the Daughters of the Red Arrow, but then was changed to the Descendants of the Red Arrow to include more people,” Thundercloud said. Those in attendance for the first time expressed their gratitude for the effort to honor all veterans. Along with Wilberg, Volk Field support staff Master Sgt. Bridget Garber also attended the Pow Wow. “To me supporting this event is a great opportunity to thank members of Ho-Chunk and to celebrate Veterans Day together as one unit,” Garber said.